Babylon, 323BC. The great general Alexander of Macedon has conquered much of the known world, and finds himself with a huge army and a court of followers from across his new empire. Some of the men would follow Alexander to the ends of the Earth, while many others complain of not having seen their homes in years and worry that their leader is becoming soft and perfumed like the people they have conquered. The general ignores the griping of his army, seeking instead his next challenge; what of the rich city of Carthage, which stands ripe for the taking? As he plots his next move, a war elephant – a new and powerful weapon that makes a grand spectacle on the battlefield – sets out on a rampage around the army’s camp. It seems that only one man can stop the elephant, a young water boy called Gajendra, who has the skills to calm the beast he calls Colossus and make him do his bidding. Seeing his abilities, Alexander promotes Gajendra to be the elephant’s mahout, a skilled rider who directs the beast during battle. A few pages on, Gajendra overhears a plot to assassinate the general, and so begins an improbably meteoric rise through the ranks of Alexander’s army that would make even Richard Sharpe blush. It is through Gajendra’s eyes that we see the last days and months of one of the greatest generals the world has ever known. 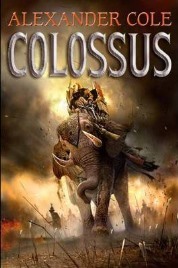 Colossus is far from the first book to give us a perspective on Alexander the Great’s life, but Alexander Cole gives us a unique and intriguing perspective from the elephant squadrons that became a late feature of his armies. It is clearly well researched, and contains a lot of good and interesting detail about the mahouts and their charges. However, I found that the book simply could not adequately hold my attention or interest. Perhaps it was the use of the present tense, which for me felt awkward and clumsy, or perhaps that the characters fell a little flat on the page. None of them felt very real; there was nothing you could feel any emotion about. By halfway through the book I could see the path of least resistance that the plot was very likely to take and saw no reason to pursue this path any further with characters I felt nothing for. I always feel that I should apologise when I didn’t like or couldn’t bear to finish a book; I’m sorry, but this was one of these. I’m sure there will be plenty of other readers who will like it, but it just wasn’t my cup of tea. Not recommended. Thank you for an honest review. Such a shame you didn’t enjoy this or feel you could recommend it as I like history and this is a subject that’s open to many stories even given the facts we know on Alexander. It should have been easily possible to bring it to life and paint fresh if not new faces on the known characters. This is one that I probably won’t even attempt now.